The 1961 Capitol Records recording of Christmas music was a smash hit for Kenton. The lush trombone section sound of the Kenton Orchestra on a gorgeous ballad. There have been many requests for a stand alone version of Kenton's theme song. Exactly as recorded on the Kenton / Capitol Retrospective CD (and the original Milestones LP). As recorded by the Stan Kenton Orchestra on "Merry Christmas", this chart has optional saxophone parts which nicely cover the french horn parts (originally written for only brass and rhythm section). One of Kenton's most important compositions. Stan Kenton had a certain touch in his arranging that stood out. 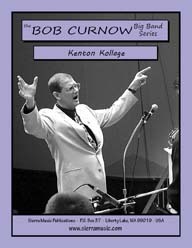 As commissioned (and recorded) by the SWR Big Band of Stuttgart, Germany, this terrific collection of Kenton tunes contains Artistry In Rhythm, Eager Beaver, Sunset Tower, Intermission Riff, Concerto To End All Concertos, Interlude, Dynaflow and Loce For Sale. Hank Levy wrote this wonderful 5/4 chart in the early '70's (1973), and it was recorded on the "Birthday in Britain" CD. The all-time, classic saxophone section feature. The original chart as played by the Stan Kenton Orchestra. 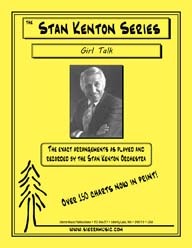 We are proud to publish another one of Stan Kenton's ground-breaking saxophone section features. The Kenton Band had many hits over the years, and a couple of them involved the whole band singing. Stan had a very definite style of arranging which, of course, was the basis of most of the music for his early bands. This is one of the amazing stories of finding what was thought to be a long-lost chart. Written by Stan in the late 50's, this chart is wonderful in its simplicity and melodic content.